The drought ends in June, and it's a doozy! Oh man, this is gonna be good! IDW Venkman: Hey, Egon...is it just me, or does that other you look kinda like Roger? 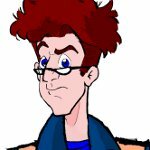 IDW Venkman: So wait...in this world, Egon looks like Roger, and the Ghostbusters are Kylie, her illiterate boyfriend, and two guys I've never heard of before? IDW Winston: Well, actually, I know who one of the others is--it's Tiyah's nephew Roland Jackson. EGB Roland: How in the world do you know Aunt Tiyah? IDW Ray: Better you not ask. I can't promise anything. I've been meaning to get to work on the next story in the Ray+Liz saga, probably fooling myself if I think it can be done for May 13th. And I have had a couple of brain drizzles about another couple of characters seen in "Enlightenment"
Today, Erik Burnham revealed the two variant covers for Issue #1 and #2. Both are subscription covers I believe. I'm sure fans are squealing at the first one. Janine: "Oh...THAT'S how Egon felt during the whole 'Roger' thing..."
cool looks like something to look far word to when it comes out. Hey, folks, long time no see. As much as a loved the first Ghostbusters movie from the moment I saw it...it wasn't until 1986 that I became the kind of Ghostbusters superfan that would one day be christened "Ghosthead". I was fifteen in the fall of 1986; a lot of people my age were "outgrowing" cartoons, and considering most of the preachy, formulaic crap that inundated Saturday Morning I couldn't really blame them. I preferred to sleep in most of the time. Then came the morning of November 1st, 1986. Except it wasn't watered down, stupid, or nonsense. As time would reveal, that episode--"When Halloween Was Forever"--was one of the best of the series. The show was called "The Real Ghostbusters" for reasons that could take up an article of it's own, but a team of top-notch writers led by J. Micheal Stracynski (later of Babylon 5) and a crew of voice actors that rivaled the comic chemistry of their movie counterparts (including, yes, the late Lorenzo "Garfield" Music) took the cinematic outline and created a full-blown world that didn't talk down to it's audience the way practically every other cartoon of the day did. That would change, as many of you well know, but let's not dwell on that--those early days were magic. I was hooked for life. So the last dozen years have been...mixed. Almost all of the "revival" products of 2003 and beyond have been aimed more toward the movie-only paradigm, albeit with a few, to use a phrase, "fun nods" to the cartoon here and there--like the Containment Unit in both 88MPH and IDW's series, the "New Ghostbusters" wearing the RGB colors, IDW Janine's haircut and her dating a guy who looked exactly like Extreme Ghostbusters Egon, and the loads of visual injokes and callbacks that artist Dan Schoening packs into every story he does. In a very specific tie-in to the RGB storylines, it takes place during a favorite episode of mine, "Janine Melnitz: Ghostbuster". It first aired in syndication in 1987; it's the 48th episode in the DVD set, and the thirty-fifth by air date. It features Janine in a strong performance, where she basically has to bail the Ghostbusters out of trouble all by herself when they run afoul of the Greek god Proteus. The fact she has a (tasteful) shower scene didn't hurt from the perspective of a horny sixteen year old either. Ironically, though, RGB Janine doesn't actually appear in this comic outside the profile picture on page 1. We see the Ghostbusters running around town stopping the ghosts that Proteus's activities have stirred up. In Schoening's penchant for injokes, a woman who looks a lot like Dahlia from "Moaning Stones" (Claudia) is being menaced by a ghost that looks a lot like Madame LaFarge from "Drool, the Dog Faced Goblin" (Natasha). The Ghostbusters catch LaFarge, and Claudia promises to help them one day. That day turns out to be today--as we see in the episode, right before the commercial break, the statue of Atlas at Rockefeller Center comes to life and zaps the Ghostbusters away. 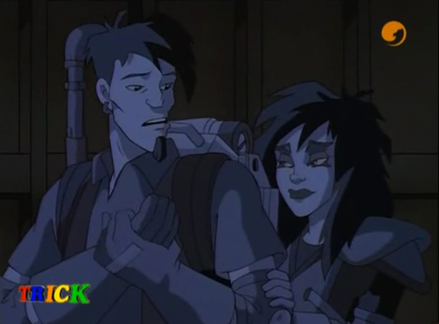 We find them later in the episode imprisoned by Proteus...but as we find out, they had a much longer trip to get there than we ever knew--Claudia apparently knows some magic, and cast a protective charm that took the Ghostbusters out of Proteus's control. Proteus shows up at Claudia's place, and he's pissed. She didn't know where the Ghostbusters have gone, so he turns her into a bird, perhaps hoping that Claudia's cat Hollis delivers what Proteus no doubt considers a more amusingly ironic ending that him just blasting her to atoms. Artistically, unsurprisingly in light of the variant cover of V2#8 (or as I prefer to call it, GB#24), Dan Schoening and Luis Delgado completely nail the look of the animated Ghostbusters. It's so on-model it could be a "cine-story" made out of animation cells. They pop up back outside Ghostbusters Central, but things look...off to them. "Drabber" Ray says. (Leaving aside that the proper phrase is "more drab", you have no idea who much I agree with that meta statement). Janine's there, but she's messing with something in her desk and neither she nor the four Ghostbusters notice that each looks...different than each is used to. (Janine, you see, has changed her hair again--ironically, in the ongoing series she sported a haircut patterned off the RGB 1986 one, but I guess to make her more "different" IDW Janine has reverted to one closer to GB1). The Ghostbusters go upstairs and everything's been moved around. Slimer is in the observation tank; they let him loose and he goes nuts, and Egon points out that it may not be Slimer. Well, it's not the same Slimer--this Slimer was never domesticated the way RGB Slimer was, and add in aftereffects of the mandala (GBVG) and Idunas (GB#2) he's a lot more feral. They zap him, and to add to the confusion the real owners of the place get home--four guys who look like the law firm that starred in their movie, but not close enough to get sued for violating likeness right restrictions. Just about then, Janine busts into the basement and gets a shock--because of RGB Egon's resistance to her ex-boyfriend Roger. (Well, a younger Roger--he looked like EGB Egon, remember?) I really hope this comes up in conversation between both Egons. It probably won't, because this is exactly what Egon hates talking about in any universe, but I can hope. I'm with you on this. I was happy to see the old RGB guys pop up, along with the interation with the IDW boys..
thinking about it it left me with some hope that at least RGB egon gets the girl in his world.